Become an athletics manager at the intercollegiate or professional level with an online sports management MBA. 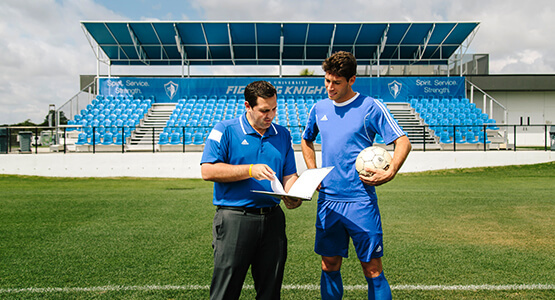 In this set of courses, you’ll apply the leadership and financial skills that the Lynn online MBA program offers to the management of sports and fitness organizations. While pursuing an online sports management MBA, you’ll learn to create an optimal environment for interpersonal and business growth while examining the issues that affect the future of the industry. You’ll also gain practice applying management theory and practical techniques to the real world challenges of organizing a successful athletic department through the specialization’s internship requirement. This specialization offers a focused, useful set of skills to become invaluable assets at any level of the sports administration field, whether collegiate, professional, or recreational.